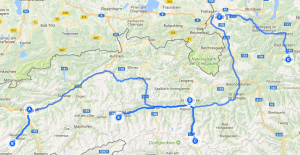 Enjoy breath taking scenery as we travel through the very best of the Austrian Alps including driving the stunning Grossglockner High Alpine road, a purpose built Alpine pass with a series of museums for visiting along the way. As well as exploring the Alpine scenery we have a tour underground to the worlds oldest (around 7,000 years) active salt mine, to Krimml Waterfall (at 380m high Europe’s largest) and enjoy stays with guided visits in two of Austria’s best cities – Innsbruck and Salzburg. And along the way eight quality group meals are included. The tour is completed off motorway so there is no need for any ‘Go Box’ or ‘Vignette’ motorway tolls. 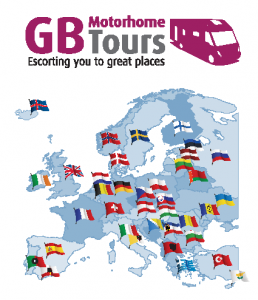 Throughout the tour there are many stunning drives, all very suitable for motorhomes as they are used by full sized coaches, however at times a confident driving approach will be beneficial. We meet at our conveniently located campsite on the edge of Innsbruck where our pitches have stunning views to the Austrian Alps. This evening the Tour Directors will host a welcome drinks reception at their motorhome followed by a group dinner in the campsites own restaurant complete with fine views of the Alps. We have a full day in Innsbruck with a guided tour of the city centre. Lunch is included in a traditional Austrian city restaurant. Today we take the Stubai Glacier cable car as high as possible, maybe we can reach the ‘Top of the Tirol’ where at 3210m the views are both stunning and far reaching. There will be plenty of time for you to take in the experience and should you wish, to have lunch in one of the mountain huts/restaurants. A free day. Our campsite is situated in the centre of Neustift village with its shops and restaurants within a few minutes walk. There are also endless opportunities for both mountain walks and cycling, alternatively just relax and enjoy the marvellous scenery all around you, certainly you will not be bored. This evening we stroll to a nearby restaurant for a traditional alpine group dinner. 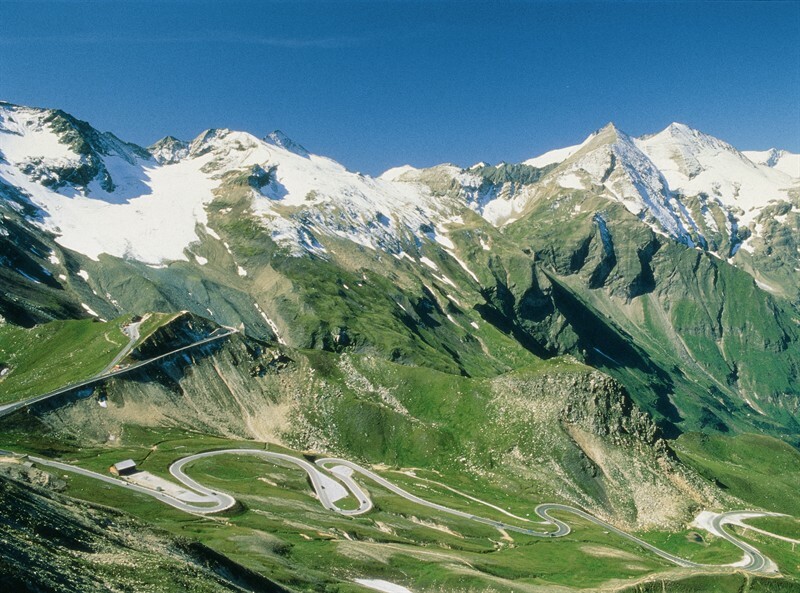 Built in the 1930’s the Grossglockner High Alpine Route is for many people simply the best driving experience in Europe. At just 30 miles it is not very long but allow all day to pass as it is so much more than just a road. The whole area is a national park and along the way are 12 museums to visit covering the history of building the road, to the efforts required for clearing the snow to open the road on the 1st May each year, to the wildlife and nature that survive and live at this altitude. We will cross the route either today or tomorrow choosing the best day based on the weather at the time. Having crossed the Grossglockner, we arrive at Zell am See and our campsite right on the lake, where we have dinner in the campsites own restaurant. 35 miles. 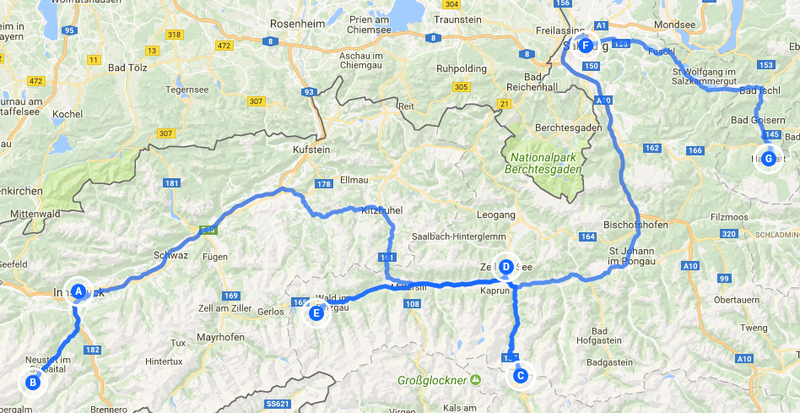 Note the Grossglockner National Park is a toll road and this is payable locally, in 2017 for a motorhome this was €40. Free time. Our Zell am See campsite is in a great location both for scenery and convenience. From the campsites own jetty lake cruisers can be taken for a tour of the lake or as transport to the city. Alternatively, it’s a pleasant 2km lakeside walk to the city centre. We have a full day in Salzburg where our English speaking guide will help us get to know this city of music. Mozart spent most of his time here and Salzburg is the centre of the ‘Sound of Music’. However, there is a lot more to Salzburg than just music as you’ll discover. Lunch is included today in a city restaurant. Today we visit the original and still producing Hallstatt Salt Mine, dating back over 7,000 years makes it the oldest active mine in the world. Not only is it a wonderful experience but also educational, covering the history of the mine and the important role salt has played over the years. Later this evening we have our farewell dinner in a picturesque area of the old town in one of Hallstatt best restaurants, it’s an opportunity to enjoy good food whilst looking back at the many great places we have visited. This morning our tour comes to an end. 4 additional campsite nights with electric hook-ups starting in Kent on Monday 14th May 2018 then in France & 2 x Germany.